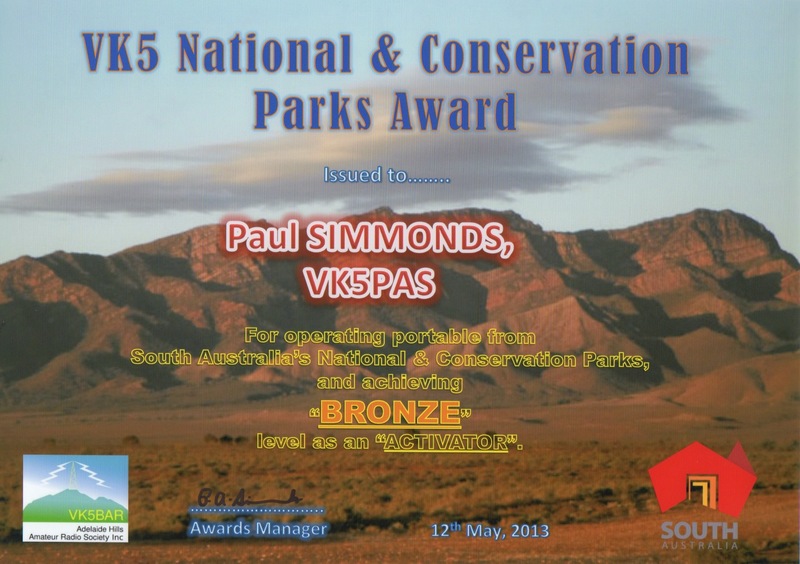 The aim of this Award is to encourage portable operation by amateur radio operators from within South Australia’s 21 National Parks (NP), and 262 Conservation Parks (CP), which are controlled by the Department of Environment, Water and Natural Resources (DEWNR). 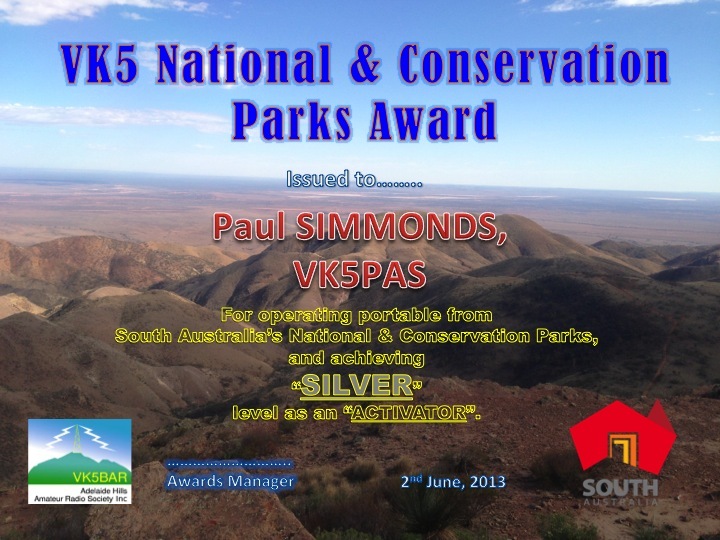 The Award is available to ‘Activators’, ‘Hunters’ and ‘SWL’s. Australian and ovserseas amateurs / SWL’s can apply. The Award is not limited to VK5 operators, and interstate and overseas amateurs / SWL’s are encouraged to participate and apply for the Award. The Award is issued in 5 tiers: Bronze, Silver, Gold, Platinum, & Diamond. Individual certificates will be issued for each of these levels. For those reaching Diamond status, an optional glass etched trophy is available. Further information can be found at…..
And on the Yahoo Group site at…..
You can also find information about this Award on my website, at…..
An excellent concept and one which raises the bar for the European operator while challenging him/herself and equipment used especially while /P, /PM or /M to initially gain the Bronze award.. I intend to do more afternoon activations (long path openings) to your part of the world, so there will be plenty of opportunities in the near future for you to accrue some points. It’s David here, VK5DGR, we spoke on air a few times over summer. I’ll be in Wilpena this weekend and will be on 7.090 around 10am SA time Sat & Sunday morning. I don’t think my Optus 3G will work there. I will be listening out for you and hope to get you in the log. Feel free to join the VK5 Parks Yahoo group and place your intentions there. It will greatly increase the number of callers that you get. You may also consider placing your intentions on the parksnpeaks site. Best 73 & good luck.